The cat’s natural, all prey diet provides her daily with fresh, raw liver. Liver is an essential part of your cat´s diet, providing nutrients especially Vitamin A and Vitamin D, but is also a good source for many of the B-vitamins, and trace minerals such as iron, copper, and zinc. Vitamin A is a feline requirement that cannot be met by beta-carotene from plants. Other than dogs, cats are unable to convert carotenoids to vitamin A and won´t be able to get any Vitamin A out of carrots etc. Liver is an essential part of your cat´s diet and feeding fresh, raw liver is always going to be the best and nutritious choice for your cat, but maybe not for you. Customer feedback has been, that liver is not always readily available in all grocery stores or butcher shops, and using this ingredient can add a messy and unpleasant step to the cat food preparation. Using the Tatzenladen Organic Liver Powder is a great alternative when you cannot source fresh liver or do not wish to handle it. Our in-house Tatzenladen Organic Liverpower is a pure, organic freeze dried poultry or beef liver powder – with no artificial ingredients added. 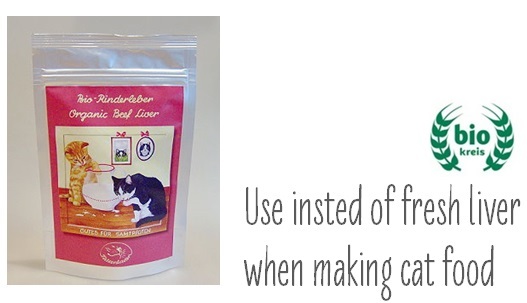 Use 25 gram of liver powder in place of 100 g of fresh liver for making your home made cat food.